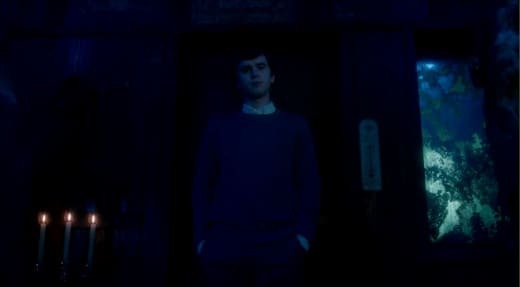 A&E released our first look at Bates Motel Season 5, and it's worst than I thought. Norma would be rolling over in her grave...if she had one. Just look at that kitchen! 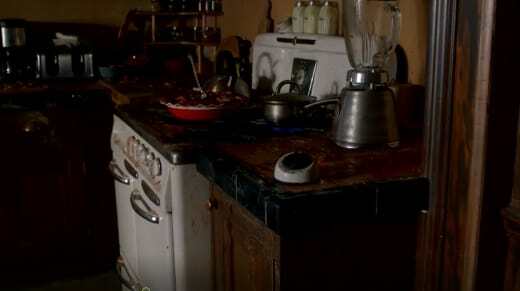 There is food sticking to the wall and the counter and the stove itself. Norman is apparently learning the hard way that it's not as easy as just stepping into someone else's shoes and becoming that person after all. But from what we see, he's more like himself in in this promo, and mom is just out and about doing her thing. Yet, she's also firmly entrenched in her permanent home. But this home is a little different than the one we remember from the movies. After all, Norma died and was buried. He can't very well put her in the window in the attic. That would certainly arouse suspicion. So Norma doesn't even get the dignity of a great view, but instead the dank, dark basement. But she does get other things. Still, more humiliating than a grave or a window seat. You need to watch. It's worth the wait, I promise. If you haven't seen how Norma ended up like this, then please watch Bates Motel online. Be here after the premiere on February 20 for a full review of the episode. We're not going to want to miss a minute!